BEST SELLER! I mean, who could say "No" to that face? This cute and customizable Small Teddy Bear sits at average 8 inches tall and has soft, embroidered eyes, nose and feet and is great for giving little bear hugs. Perfect for customizing and sending to military loves, kids at camp and others away from home. Print will be a bit transparent. For example, black will be a very dark grey, just as it is rendered in the design center. Note: t-shirt design is small and will print roughly 2.50" wide. 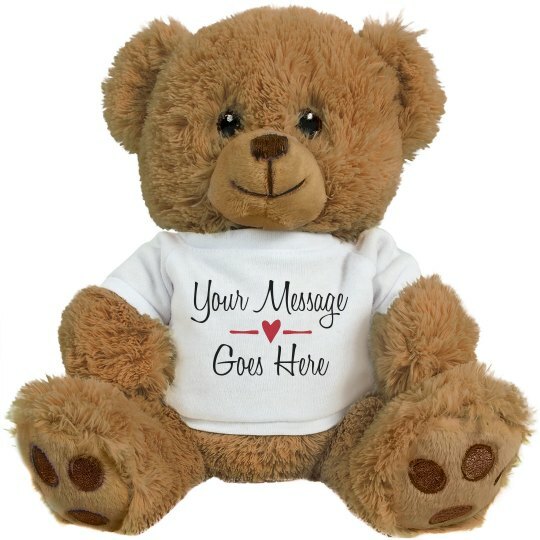 Send the perfect Valentine's Day gift to your special someone with a personalized stuffed teddy bear. Personalize it in our easy to use design center by adding a special message that is meant for your V-Day date.